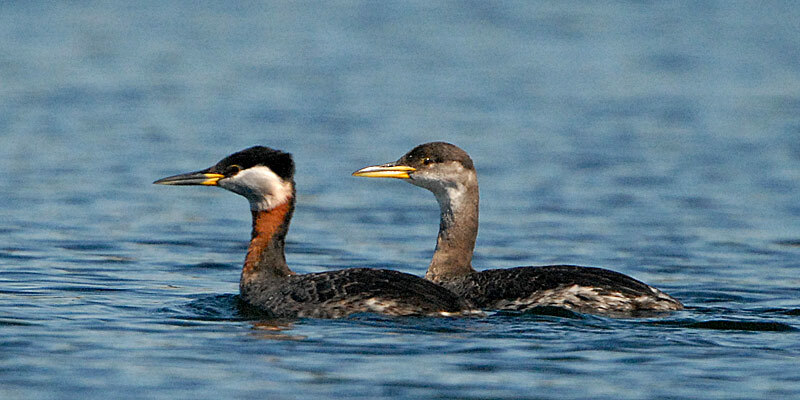 Top: breeding (left) and immature-type (right) red-necked grebes. Photo by Mike Yip. Left: red-necked grebe in transitional plumage (between winter and breeding). Right: in breeding plumage. Photos by Brian Starzomski. When in breeding plumage the red-necked grebe is distinguished by a reddish-brown neck which contrasts against a white or pale grey throat and cheeks. The top of its head is black, and the back of its neck, wings, and back are dark grey or black. The reddish colouring disappears in the winter plumage, and the white chin patch extends further back along the sides of the head. The juvenile plumage is similar to the winter plumage but with dark stripes on the sides of the head, and with some reddish tones on the neck. The red-necked grebe is found on ocean — open offshore waters as well as protected bays — in winter, and on lakes and ponds in marshy, grassland, forested, and sometimes tundra habitats in summer. Its winter range extends along much of the east and west coasts of North America, while its summer range stretches across much of Canada and Alaska. 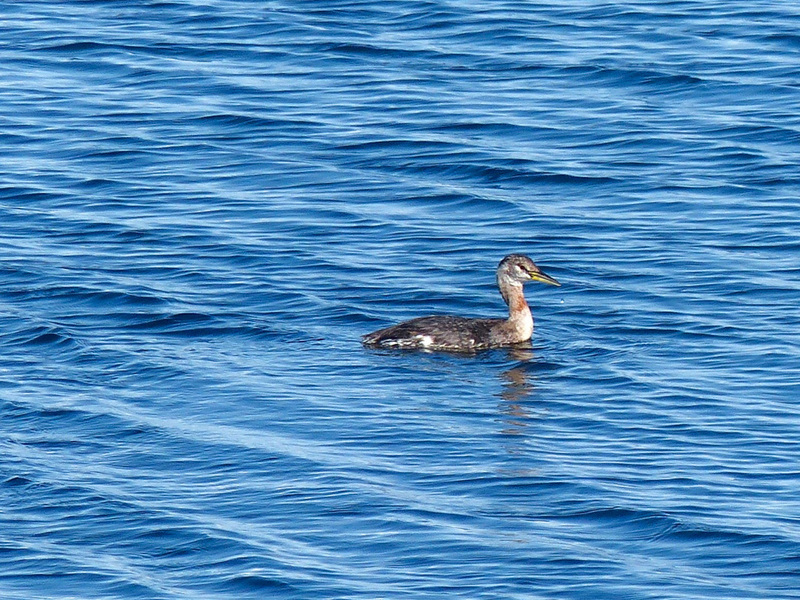 The horned grebe (Podiceps auritus) and the western grebe (Aechmorphus occidentalis) are both found in Central Coast waters during winter. In winter and when moulting in spring the former could be confused with the red-necked grebe; it has red eyes and a much smaller, darker bill, and in winter the transition from white plumage (on the throat and lower face) and black plumage (on the grown and back of neck) is more distinct. The same is true of the western grebe's winter plumage. It also has red eyes. Grebes ingest large amounts of their own feathers, which stay in their stomach; they also feed feathers to their young. The feathers possibly to help pass indigestible bones and other material through the digestive tract, though the exact reason for this behaviour is currently unknown. Red-necked Grebe Podiceps grisegena. Audubon Birds. National Audubon Society. Accessed 03/03/2016. Red-necked Grebe Podiceps grisegena. The Birds of North America Online (A. Poole, Ed.). Ithaca: Cornell Lab of Ornithology. Retrieved from the Birds of North America Online. Accessed 03/03/2016. Dunn, J. L. and Alderfer, J. (Eds.). (1999). National Geographic Field Guide to the Birds of North America. (3rd Ed.). Washington, D.C.: National Geographic Society. Pp. 74-75.